Models for Enabling Continuous Reconfigurability of Secure Missions, a five-year, $23.2 million cooperative agreement, will form a collaborative research alliance consisting of Indiana University, Penn State, Carnegie Mellon University, University of California Davis, University of California Riverside and the Army Research Laboratory. The aim of the alliance is to create a science to detect and model cyberattacks and the risk and motivations behind them, and to create a response that can counter the attack and neutralize the cyberattackers in real time. Consortium researchers -- including three Indiana University Bloomington faculty members -- will jointly develop the research program, and lead and conduct research under the alliance. School of Informatics, Computing, and Engineering professor L. Jean Camp will serve as the principal investigator for the IU portion of the work, with Bennett I. Bertenthal, a professor in the College of Arts and Sciences’ Department of Psychological and Brain Sciences, and Diane S. Henshel, an associate professor in the School of Public and Environmental Affairs, joining in the work as co-investigators. Indiana University is leading the risk component of the project, as well as participating in other dimensions. Risk is probability and harm. 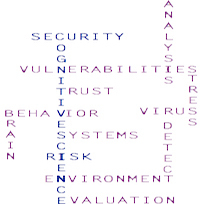 Probability and harm are a function of the security decisions of a specific person at a given time within a complex virtual and physical environment with the cognitive neurocapabilities of the decision-maker.